Any way, here I am, driving to my first customer, and boy oh boy, I had some pressure. The real estate agent already worked with Visual Tour and had a virtual tour done of the house, and he JUST wanted to compare it with my services. Did I mention it’s my first virtual tour? Still nervous, but ringing the doorbell, the show must go on. I get started and after 35 minutes, once I had taken the living room-dining room and kitchen area in all possible angles, my camera tells me: No memory card. Luckily, at that moment, the real estate agent is chatting, as he would have probably called 911 seeing the color of my face draining out. I shook my camera a little bit, just to remove the bad spell, but no, the message is still there. So, I decided to turn off the camera, praying with all I got that it turns back on and miraculously, that this nasty message goes away. NO instead I got another one. “Memory card MAY BE defective”… another silent moment goes by. Then I hear some steps: “ Is everything all right Kate?” Another long silence goes by. “No” (At that point, he probably didn’t hear my answer). Bravely, I decided to remove the card, not really knowing what will happen, (Eh, everything could disappear), I put it back, still can’t get access to any picture taken earlier and can’t take another one either. My mind is running: ok, where is the closest Best Buy/Target/Walmart, ANY store with a memory card…. I am thinking it will take at least 30 min back and forth … I am dead… just bury me now. Forget, I exist. But I didn’t have to do anything. My angel real estate agent turns to me, and says: “Why don’t you try my cameras memory card?”… It worked. I went home, with sweating palms, praying (again), that my first 30 min of pictures are ok, and yes they were. I am missing one 120 pano, and of course the 12th picture of the kitchen-dining panorama… but not too bad. Could have been way way worse. So bottom line, YES A MEMORY CARD can fail on your first virtual tour. And yes, I will always have two cards with me from now on. I still had a good time, and I am looking forward to do it again! If you’ve ever visited New Orleans, you may have heard the word “Lagniappe”. Lagniappe derives from New World Spanish la ñapa, “the gift,” and ultimately from Quechua yapay, “to give more.” It is still used in the Gulf states, especially southern Louisiana, to denote a little bonus that a friendly shopkeeper might add to a purchase. I’ve always considered Lagniappe to mean a little something extra — a bonus which is appreciated but was certainly not expected. For our Charleston virtual tour business, our Lagniappe comes in the form of RTV’s Tour Track jobs. RTV is a national virtual tour company with a strong web presence so it’s not unusual for them to get leads or to land national clients who need virtual tours in different areas. Because we are a part of their network of virtual tour photographers, they share those virtual tour leads with us when one of the leads is in our area. As an independent virtual tour business owner, if we don’t shoot, we don’t eat. Any entrepreneur knows the feeling of waking up everyday knowing that it is our responsibility to close new business if we want to keep our virtual tour business going. As our business has become more established, more of our business comes from referrals and repeat business from existing customers that we have closed ourselves. At the same time, as our skills and experience photographing virtual tours has increased, we have had the opportunity to photograph more Tour Track jobs. As the sales and marketing person for our virtual tour business, I am ecstatic when we get a Tour Track order. Tour Track jobs are photography and virtual tour business that someone else closed and all I have to do is schedule the virtual tour and show up to shoot. I don’t have to solicit the sale, negotiate the price, or convince the customer of the value of a virtual tour. For me, getting a Tour Track order is like finding money in a coat pocket that I haven’t worn for a while. I don’t expect it, I don’t depend on it, but I certainly do appreciate it when it comes. Thanks for sending us of the apartment photography jobs RTV! Did I mention previously that one of the reasons why I signed on with RTV was the incredible support that they offer. Aside from the fantastic virtual tour software and equipment, I was quite pleased with the fact that they had RTV providers world wide and an annual conference. I booked my room at the Park Place Hotel in Traverse City a couple of days before the conference. With husband and kids in tow we were off on a road trip to Traverse City Michigan for the 2012 RTV Conference/ family road trip. Our trip wasn’t really off to a good start though; the weather conditions were less then perfect as we were headed right into a storm and our children started to ask the dreaded road trip questions, “Are we there yet?” and “How much longer will it take to get there?” only fifteen minutes after we had left. It was going to be a super long drive! Finally we arrived and we survived the 10 + hours of driving. We were very happy to get out of the confines of a minivan. I was really excited but also a little nervous to attend the virtual tour conference. I didn’t know what to expect. I didn’t know anyone at the conference with the exception of Jason whom I spoke with via telephone and Ben whom I had contact with via email. My mind was immediately put at ease when I was greeted by a very friendly woman by the name of Jacque, RTV’s National Accounts Manager. I eventually met Ben and the rest of the RTV team from Traverse City and numerous RTV providers and virtual tour providers from across the United States and a few Canadians. There were many full service RTV providers whom had been with RTV for some time. They offered tips and advice that would help me get established. The seminar topics were wonderful and the speakers were very knowledgeable. The food provided was good and the company was great! I am really glad that I decided to attend the RTV virtual tour conference because it was well organized, very informative and it was a lot of fun. Not only was I made to feel very welcome, I got the feeling of being a part of something big as they launched their new Fusion virtual tour system. I went home feeling extremely pumped and so motivated that the fact that I had a long drive ahead of me with children, didn’t even phase me. I’m looking forward to attending the 2013 RTV Conference in Las Vegas. do a complete 360° Tour. * Tried of spending big $$$ for your agent open houses and only getting a few or the same agents coming by? * How much does it cost you to run an AD, food and gifts for your open house? $50, $100, $125 or more? * How long does that marketing last? the day of the open house, a few days later or even a week? 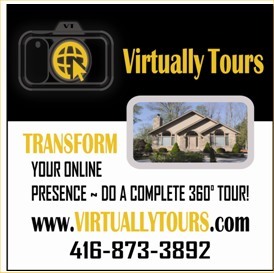 Using Elite Virtual Tours, your marketing money will last 24/7, 365 days a year and exposed world wide! 2. Complete virtual tour “HIT” report providing… Unique vs return visitors, what day of the week and hour that gets the most hits, which pictures are view the most, which search engines, did viewer down load virtual tour and much more….. this is a weekly report. Its great for listing presentations too. Visit our web site www.EliteVirtualToursGA.com and review the information and our current tours. See for yourself how the 360° Panorama looks and feels. We’ve also scripted out each slide for you and will be making several updates and work to have Version 2.0 professionally voiced for you. 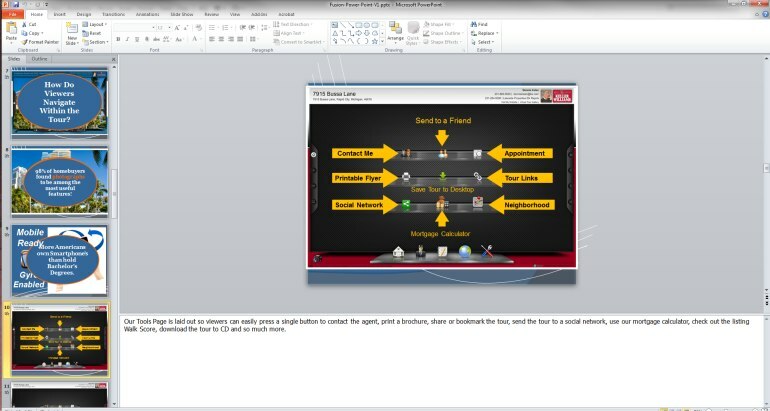 Use the included script as a base to voice your own presentation for further customization. We expect to have Version 2.0 of this presentation out to you in December. While you work to customize this presentation please be sure to use your own Fusion presentation screen shots so your presentation matches your geographical area and also so you’re not using anyone’s images. Thank you! This month our marketing team is also releasing to you the “Agent Marketing Plan”. This was put together with the help of Mike Thompson from Real Vision Studio. 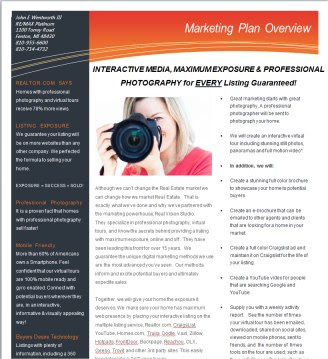 The agent marketing plan is a nice document that you can give to your agent to use during their listing presentations. Finally we’ve also included an updated version of the Agent Listing Brochure in this bundle. This update has many revisions on it and we recommend that you login now and get the updated version. Please send any suggestion/recommendation or requests to marketingATrealtourvision.com and remember to login to your www.RockPointeMarketing.com account today and snag all these pieces!!! Happy Thanksgiving!